Our "eco-Vegan" option features quality components, and no animal by-products, such as wool. 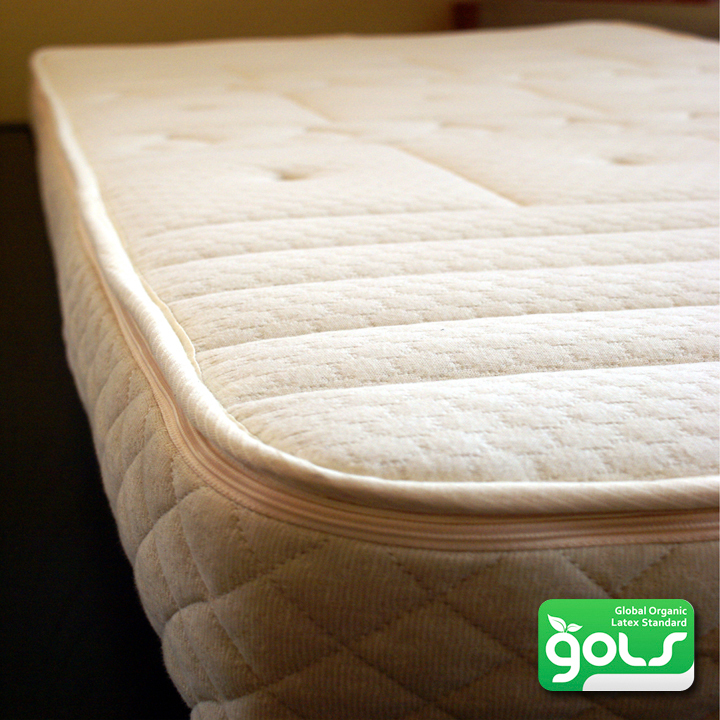 All of our mattresses are available with a VEGAN option, meaning we don't use any wool in the quilting. Our organic cotton matelasse knit fabric is quilted to our vegan batting derived from plant-based fibers which meet federal regulation flame resistant standards. No prescription required! Inside components feature pure and durable natural latex support and comfort layers - no synthetic foams. Our Eco-Vegan option offers top-quality, superior construction and classic simplicity. What is eco-Vegan Quilting? We use a special blend of plant-based fibers to create our vegan-batting. There is no cotton batting used, however over the past several years we've been working with PLA (polyLacticAcid) which is derived from natural plant substances. In fact, many food items in a vegan diet contain lactic acid. The PLA used in our batting is made from fermenting the sugars of starchy plants, then finished into a loft-fiber that's temperature regulating, moisture resistant, and has natural flame resistance properties. We've found that PLA-based fibers have many of the same wonderful benefits of wool... without using wool. It's the perfect choice for vegans! It's easy to order your VEGAN mattress. Just browse our various mattresses and the bottom of the page when selecting your size, also choose the "No Wool" option. That's it. If you have questions, just give us a call during normal business hours at 800.229.7571. We'll be happy to assist you!